Four laser marking systems are available for permanent and consistent marking. The systems offer high speed coding of several lines of text and produce high quality marks for precision bar codes, tests and identification marks including complex logos. Some universal features include creative design capability, easy creation of messages, and reliable operation. 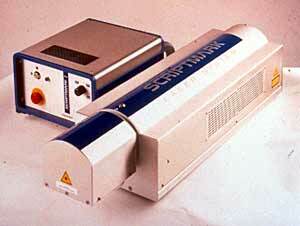 Two different styles of lasers are available—a scanning laser and a dynamic laser. Scanning lasers operate by steering a single beam with two galvanometric mirrors essentially drawing with a single beam of light. Both CO2 and Yag scanning lasers are offered. A dynamic laser prints in a dot matrix pattern with 18 dots top to bottom allowing for one, two or three lines of marking. Matthews International Corp., Marking Products Div., 6515 Penn Ave., Pittsburgh, PA 15206. Phone: 412-655-2500; Fax: 412-665-2550.